A cartoonist often uses humor to illustrate issues that aggravate people. 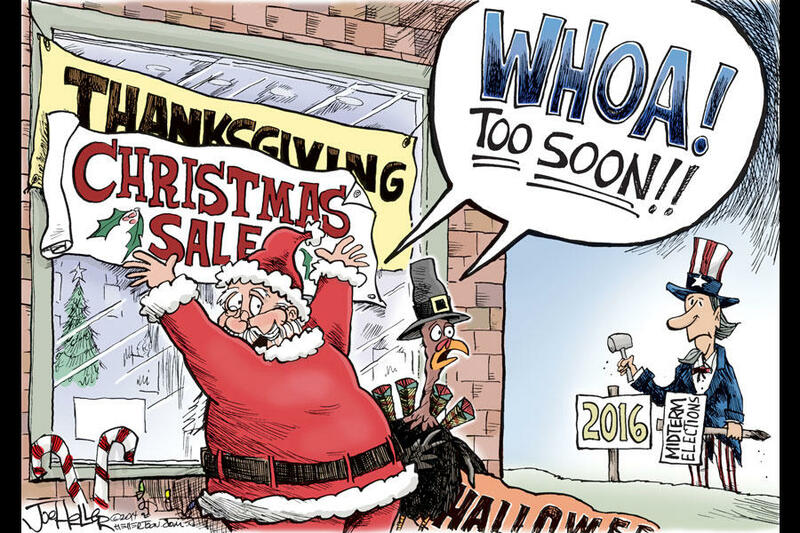 What device does the cartoonist use to highlight this trend of starting every season (from Halloween to presidential elections) earlier and earlier? c) symbol: An object, character, figure, place, or color used to represent an abstract idea or concept. a) caricature: A description or characterization that exaggerates or distorts a character’s prominent features, usually for purposes of mockery. For example, a cartoon of a gaunt Abraham Lincoln with a giant top hat, a very scraggly beard, and sunken eyes could be considered a caricature. b) sarcasm: A form of verbal (or visual) irony in which it is obvious from context and tone that the speaker means the opposite of what he or she says. d) understatement: A figure of speech in which statements are purposely understated. It may be used to indicate the speaker’s nonchalance (or obliviousness) regarding an often important or otherwise remarkable situation. It often results in irony where, for instance, the speaker’s response to an event does not match how the viewer expects the speaker to react.